Note: all lectures will be held at Onslow Village Hall, Guildford. Events of interest external to the society. The Victorian era was a dynamic period of innovation, imagination and get-up-and-go, but some Victorians questioned the ‘progress’ that was being made and were fearful for the future of craft skills and thoughtful way of life. This talk reviews the conditions surrounding carpet use and manufacture at that time, including the part played by the Arts and Craft Movement. The subsequent history of the carpet industry is also briefly covered, together with the loss of skills and technologies; and the consequences of inaction for our culture and historic environment. Mo Mant, MSc Hist Cons, is co-founder of the not-for-profit conservation project The Living Looms Project, which seeks to maintain, through production and training, traditional textile skills and technologies for future generations; to deploy and develop in traditional and innovative ways. Initially weaving replacements for worn or damaged fine historic carpets, the Project aims to rescue threatened looms and support other textile initiatives. Locations for Looms replacement carpets include the National Trust’s Felbrigg Hall in Norfolk and the Hampton Mansion near Baltimore, Maryland, owned by the National Parks Service of America. The creation of the Birmingham School of Art in 1885, Britain’s first municipal college of art, provided the impetus for the local Arts and Crafts movement. Although Edward Burne-Jones and William Morris did not teach at the school, they were very supportive. Burne-Jones’s windows for St Philips designed between 1885-91 were in effect a gift to the city of his birth. The art school's energetic headmaster, Edward R. Taylor, a devotee of art critic and social thinker John Ruskin, took a personal lead, founding the Ruskin Pottery at Smethick, Staffs in 1898. Former students, Arthur Joseph Gaskin and his wife Georgie Gaskin, began making jewellery in 1899. The Birmingham Guild of Handicraft, formally established in 1895, also provided a hub for local craftsmen. Anne Anderson is currently Associate Professor at Exeter University, a tutor at the V&A and NADFAS lecturer. Her specialist knowledge is the Aesthetic Movement, Arts and Crafts, Art Nouveau and Modernism. Previously, she taught on the Fine Arts Valuation degree at Southampton Solent University. The Technical Educational Acts of 1889-1891 opened up country-wide adult education and this lecture will concentrate on the opportunities that programmes of craft and art education afforded women at a time when access to other forms of education were costly, difficult or impossible. The revived crafts of the ‘Arts and Crafts Movement’, from calligraphy and vernacular pottery to carving and weaving and dyeing, were supported by technical education and constituted a particularly fruitful avenue for women to gain an education within the arts when more formal channels were barred. Dr Stephen Knott is a writer, researcher and lecturer in craft theory and history. He is author of Amateur Craft: History and Theory (Bloomsbury, 2015). Stephen was the founder post-doctoral fellow in modern craft at the Crafts Study Centre, Farnham, and is an editor of The Journal of Modern Craft. Currently lecturing in Critical and Historical Studies at Kingston University, he is working on a new book about making and free time. Tickets: Members - £10 each or £27 for three, Non-Members - £12 each. Refreshments will be served before the lectures. Members have been sent an application form, non-members may to apply for tickets. The morning will begin at St Peter’s Church in Hascombe. This richly decorated church was rebuilt by the architect, Henry Woodyer, in 1864. It has an unusually complete mid-Victorian scheme of decoration. One of Simon Jenkins’ 1000 best churches, it was described by Sir John Betjeman as “a Tractarian work of art”. This will be explained by the church warden, Colin Swait. After visiting the church, we will walk round Hascombe in a circular route for about an hour and a half. Part of the walk will be across fields. We will see a number of Arts and Crafts buildings- some associated with Sir Edwin Lutyens and with work undertaken by Underwoods, Lutyens’ favourite builders. We will finish the morning with lunch at the White Horse at Hascombe before a further half hour walk for those energetic enough to continue! The walk will be led by a Society member, Sarah Sullivan. Sarah works as a historic buildings and conservation specialist. She is a key member of the Society’s Recording Committee and has lectured to the Society on a number of occasions. The Lutyens Trust is kindly allowing the Society to hold a study day at Goddards during their summer week at the house. 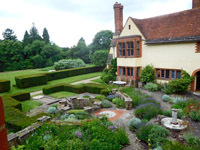 Sir Edwin Lutyens designed Goddards in 1898-1900 for Sir Frederick Mirrielees as a place where ‘Ladies of Small Means’ might rest and enjoy the courtyard garden planted by Gertrude Jekyll. Goddards was given to the Lutyens Trust in 1991 and subsequently restored by the Landmark Trust. The Lutyens Trust archive is held in the Study-Library. Escape to the Country: George Edmund Street at Holmbury St Mary a lecture to be given by Richard Peats, an Inspector of Historic Buildings and Areas for Historic England covering Berkshire, Oxfordshire and Buckinghamshire. Richard has researched Street’s work on churches within the Diocese of Oxford. He will also act as guide during the afternoon visits. George Edmund Street (1824-81) is best known as architect of the Law Courts in the Strand. The village of Holmbury St Mary (then called Felday) was the chosen location for the creation of his own home. We will visit the Church of St Mary the Virgin, designed by Street in 1879 in memory of his second wife. The stained glass by Clayton and Bell was also designed by Street. Following the sunken lanes we will drive on to the village of Peaslake; a gem within the Surrey Hills. Here we shall see the cluster of buildings comprising the Old School Room, The Spottiswoode Memorial Hall and, set into the hillside, St Mark’s Church, built in 1889. The Church was designed by the architect Ewan Christian, a friend of GE Street. We return to Goddards for teatime. Tickets: Members - £42. Included in the ticket price: morning coffee, sandwich lunch at The Royal Oak, tea and cakes, study notes and donations. Members have been sent an application form, non-members may to apply for tickets. Numbers are limited and priority will be given to members. DISCLAIMER: You participate in events at your own risk and neither the Society, nor its officers or the organiser of any event accepts any liability of any kind whatsoever, however arising. The Society reserves the right to cancel or postpone events if necessary. Members are reminded that they should have adequate personal and travel insurance.